Here, to watch the documentary “The noise of Cairo”. Turbulent changes are still plaguing the Middle East. What all this will lead to is not yet completely clear. However, there have been some tangible results: the Arab Spring, at least for the moment, has put an end to decades of (self) censorship and terror, unacceptable legacies in such times of globalization. Consequently, different forms of artistic expressions have stemmed from the Arab upheavals. The documentary The Noise of Cairo is the first relevant work of its kind, produced as a consequence of the interplay between art and revolution in Egypt. Filmed in Cairo in 2011, a few months after those tumultuous 18 days leading to the resignation of former President Hosni Mubarak, it talks about the radical social changes taking place in the country, amidst expectations that politics may also find its way towards rebirth. Produced by Scenes from and directed by the 36 year-old German film director Heiko Lange, who has dedicated 10 years of his life to TV productions in Berlin, The Noise of Cairo presents the city’s art scene which is flourishing once again and plays witness to the vibrancy that for years has characterized its heart and underbelly. The lead actors of this cinematic adventure are, first and foremost, the art gallery managers of downtown Cairo: Sherwet Shafiedi from the Safar Khan Gallery, William Wells from The Townhouse Gallery and Ali Abdel Mohsen, who curated the Maspero Exhibition at Darb 1718 . Then, like aircraft roaring off a runway, we have Sondos Shabayek (director and interpreter of the Tahrir Monologues), Hany Rashed (pop artist), Osama Moneim (painter), Khaled El Khamissi (writer), Khaled Hafez, Keizer (street artist), Shaimaa Shaalan (female singer and songwriter), Ramy Essam (the singer of the revolution arrested by the military for his anti-regime chants), Ezzat Ismail (dancer) and Karima Mansour (a choreographer and dancer who is now back in Cairo theatres after a hiatus of some years). Here there is an interview with the film director Heiko Lange to explain how he came up with creating this project. Q. The Noise of Cairo is a self-production. Did you arrive in the city with this documentary already in mind? A. The idea hit me while watching the beginning of the Egyptian protests on Al Jazeera. I was awestruck by the genius in the content of posters, leaflets, slogans, and songs playing in Tahrir, and by the good-humoured nature of the demonstrators. So I started taking an interest in the subject of creativity which can burst out, in particular, of radical changes like those in Egypt. The next short step was child’s play. Q. What has it been like working with these artists? A. While we were filming, some of them were still personally involved in the protest: they often disappeared, and then you found them again in Tahrir Square during an impromptu sit-in. It was difficult to organise the shooting, I had to revolutionise my agenda continually. Q. So…was it smooth sailing? A. It was easy to get distracted by the events, which were at times dramatic and continually going on in town. For example, on the last day of shooting – we had arrived in Cairo at June-end and we left on July 9 – another “March of the millions” was to take place in Tahrir Square as usual. We were wondering on the wisdom of filming the rally. We were however dissuaded as it was widely believed things might come to a head. Q. Did you have to cut any shoots? A. In twenty hours’ footage over 10 days, there are just a few scenes we scrapped. That related to the meeting organised by a blogger (Tweet Nadwa, editor’s note). The room was crammed with people on Twitter and Facebook, obsessed primarily by the economy. A gathering which would have been impossible and unthinkable before the January 25 revolution. Unfortunately, during the editing, we had to cut this scene as not to stray from the focus of our work. Q. Are you still in contact with the cast of your documentary? A. Sure, with most of them, through Facebook. I also met two actors in Germany at events: Khaled Hafeza in Frankfurt and Hany Rashed in Berlin. Q. And now your next brainchild……The Noise of Casablanca, for example? A. I’m not interested in using this formula for making a serial on cities. Should I change my mind, however, I will definitely not use the same title. 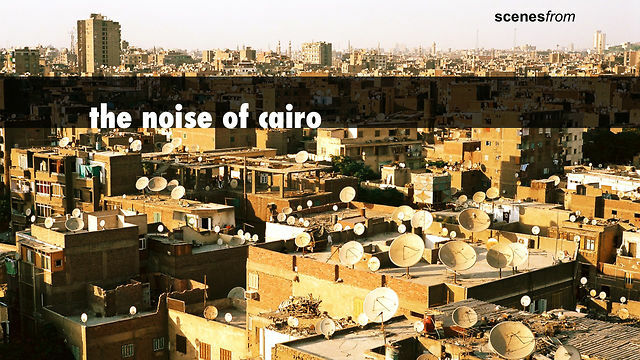 Noise of Cairo is the hustle and bustle belonging only to the people of Cairo, to those who are still there fighting to salvage their revolution and who are still considered a nuisance by the government!